Chimney leaks can cost homeowners hundreds and even thousands of dollars in repairs if not promptly resolved. But we’re here to help. The team at Jiminy Chimney works to promptly locate leaks and put a stop to water entry. Whether your chimney leak is new or old, we can help. We’ll start by looking at the most common culprits, including the masonry, the flashing, the chimney cap, and the crown. Many people know that masonry is porous, but don’t give much thought to what that means in terms of the chimney. Because brick and mortar absorb water, when they’re exposed to prolonged periods of rain, sleet, and snow, especially when temperatures fluctuate, they can begin to decay and deteriorate. As this happens, more and more moisture is invited in, furthering the degradation. Damaged masonry is often to blame for chimney leaks, but we’re committed to preventing this. That’s why we provide expert tuckpointing and brick replacement services, and professional masonry waterproofing services. 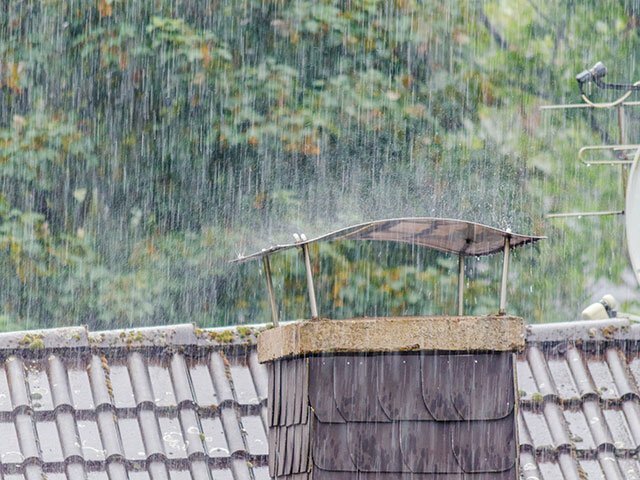 Here at Jiminy Chimney, we use ChimneySaver water repellent, which is vapor-permeable and reduces moisture entry by 99.9%. Waterproofing your chimney with this quality product won’t change the look of your masonry or leave a shiny film like other products. You’ll just know your chimney’s masonry is protected and ready for whatever the seasons bring. The metal flashing that works to prevent water entry where your chimney extends past your roof plays a key role in chimney leak prevention. But unfortunately, flashing can fail as a result of poor installation, low-quality materials, and weather damage. If your flashing is responsible for your chimney leak, our team can repair or replace it and put a stop to your water problems so you can keep your chimney and home leak-free. The cap that closes off the chimney flue is really the flue’s only line of defense against water intrusion. Unfortunately, severe weather can cause the cap to come loose, leaving an easy-access entry point for moisture. If a missing cap is to blame for your chimney leak, you can count on Jiminy Chimney to replace it with a high-quality, attractive chimney cap. Whether you have a single flue chimney or a multi-flue chimney, we have a cap that’s just perfect for your system – guaranteed. We also offer lock-top dampers, which can serve as a cap and a damper in one – learn more here! Of course, chimney leaks can also occur as a result of a damaged chimney crown, which is the cement block that seals off your chimney stack. To learn more about chimney crowns and our crown repair services, please click here. Schedule An Appointment & Put A Stop To Your Chimney Leak Today! If you have any questions about chimney leaks or think you may have a leak, give us a call at 847-893-0063. We’ll make sure your chimney leak is a thing of the past and that your chimney is properly protected against future problems. Call or request an appointment online today! Our fireplace and chimney repair professionals can easily determine if you’re in need of a chimney crown repair. Find out more when you schedule an appointment.